Get in touch with us to find out more about our cottages and availability. We’d love to hear from you. Some fields are mandatory so please don’t forget them. We can be easily reached from the north or south by either Hwy. #11 and Hwy. #522, or Hwy. #69. From Hwy. #11 coming from north or south, head west on Hwy. 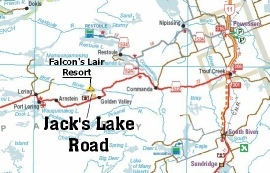 #522, 40 kilometers to Jack's Lake Road. From Hwy. #69, head east on Hwy. #522, 70 kilometers to Jack's Lake Road. Follow Jack's Lake Road straight to the end.